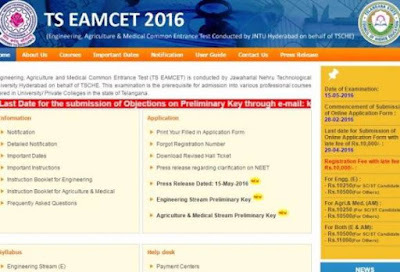 As many aspirants from Telangana and other state who wrote TS EAMCET 2016 is waiting for results of TS EAMCEt 2016 the wait is over and the TS EAMCET (Engineering, Agriculture and Medical Common Entrance Test) results are out by the education minister and are available on its official website which are declared today at 11 am on its official website www.tseamcet.in (TS EAMCET 2016) official website. Telangana state Engineering, Agriculture and Medical Common Entrance (TS EAMCET) 2016 is now being conducted by JNT University Hyderabad (JNTUH) on behalf of Telangana State Council of Higher Education (TSCHE) for this year 2016. TS EAMCET this examination is the prerequisite for admission into various professional courses like engineering and medicine offered in various Universities / Private Colleges that are available in the state of Telangana after the bifurcation from AP. Step 2 :After you visit you will see screen like this "Results "
Lst year eamcet 2015 and in the year 2014, OMR Answer Sheets of all the candidates who have appeared for the entrance test were hosted in the website at the time of declaration of Ranks so that it give transperency for students. the same was continued in the year 2015 as well, which received immense appreciation and testimonials from all sections of the people.